Our landlady has very kindly given us the use of it while we’re here. 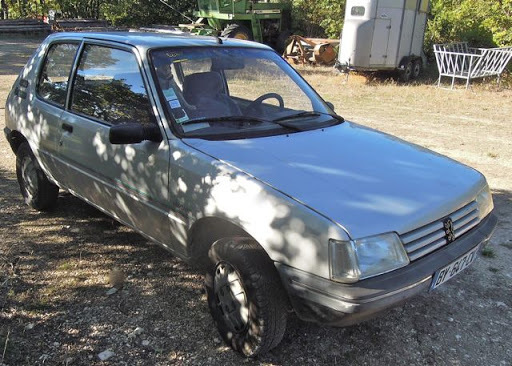 It’s a Peugeot 205, I think it’s sixteen years old (same as Jeepy, funnily enough). She described it as a “fun little car” and said she loves driving it. Hmmm. I have a suspicion she thinks it’s “fun” and “loves driving it” because she’s high on the fumes which fill the cabin whenever she drives it. The driver’s seat is broken, and is “repaired” with a thick piece of memory foam. Actually, this works – it feels completely lopsided and weird when I sit on it, but after a few minutes, I find it has moulded to my shape. The landlady emphasised that the Heap is only up to short local trips, but it would be ideal for me to get to the local shops and the horses whenever the LSH has used Jeepy to get to the airport. Ok, so, the first time he was away, I decided to nip over to Manosque and do some grocery shopping. After about 10km on the twisty, windy, hilly road to Manosque, the rattle of the boot and the rumble of the wheel bearing were being drowned out by a high-pitched screaming noise, emanating from somewhere around the front end of the Heap. This got louder and louder, so much so that people were turning to look as I drove past on the busy streets of Manosque. I tried to make myself look like an eccentric French woman, but to no avail, I could only have looked like a very embarrassed and worried foreigner. I finally made it to Hyper-U and switched off the ignition, praying it would start again when needed, to find that the engine cooling fan was also roaring – the sound of the fan, rumbling wheel bearing and rattling boot had all been drowned out by the high-pitched scream. The fan had stopped by the time I got back with the shopping, and the Heap, true to form, roared into life as soon as I turned the key. The high-pitched scream didn’t start again until I was about half-way home, on the country road between Manosque and Les Granons, so thankfully, I wasn’t turning heads again. Don’t get me wrong, we are truly grateful to have the use of the Heap, although I’m not convinced it will last for the whole year. Without it, I would either have to cycle 7km each way to see the horses when the LSH is away, or I would have to drop him to Marseille each time he’s going anywhere. I think I’d rather take my chances with the Heap, thank you. Every time I drive it, I’m reminded of a song my daughter had on her MP3 player when she was in school (I made her take it off, in case she got into trouble). If you’re someone who is offended by lots of bad language, don’t watch this video. Everyone else : this perfectly describes the Heap. There is another car lurking in the Bergerie under the house which we have been ASKED to take for a spin every couple of months, but that’s another story. LMAO, Dee, I'd forgotten about the mean green machine!You win, the mini was worse than the heap! Hahahaha! I remember that song from back in high school! Brings back so many memories, including the first car I ever owned.But, you are lucky to have use of it, and maybe after enough driving around and inhaling the fumes, you will think its a fin car, too!